Adding a blog to your ecommerce site is a popular way to drive traffic and increase brand awareness. But, figuring out what to write about is the most important issue. Thought-provoking and compelling content is key. Here are some tips on how to develop the editorial process and create that “must-see” content on your own store blog to help drive up traffic. Once you have your blog set up, start the process by brainstorming compelling topics that are related to your industry, business, products or services. First, identify your audience. Look at the demographics of your store — what are the personal details of your customer base? What products are they buying the most? What are their lifestyles and what lifestyle does your brand represent? Try to distill this information into an “audience” that you write to. Then focus on ideas that broaden your brand and your store identity so your blog reflects the lifestyle of your customers. If your blog can capture the essence of a certain lifestyle, chances are your readers will identify with your brand accordingly and be loyal to it because it’s a part of their own personal lifestyle and identity. For example, if your store sells snowboarding equipment, you might consider topics that include industry news, snowboarding sport or athlete news, tips on proper riding technique, equipment reviews and do-it-yourself equipment repairs. Above all, focus on topics that are interesting for you to write about and for your customers to read. If the topics, and the content that grows from them, are not interesting to you personally, blogging will be short-lived for your company. But, if you write about topics that are of interest to you, it is far more likely that you’ll want to continue the process. Your passion and your understanding of your store’s products and customers will translate to your readers, and it makes for a loyal readership. It goes back to that old adage of Mark Twain’s, “write what you know” — that holds true for blogging as well. Even if only one person is writing for your blog, set up a calendar to stay on track. This can be done with a Microsoft Excel or a Google Docs spreadsheet. Create a chart that reflects all the days in a month and fill in the content, day-by-day, week-by-week. Be sure to come up with a realistic amount of content you can publish each day, week and each month. The more frequent you publish something on your blog, the better your chances are of gaining a solid readership. But, ultimately, quality is more important than anything quantity. So take the time to craft well-written and thought-provoking pieces that capture your brand and the identity of your customers. Try to be consistent. If you publish a piece a day, try to make that something your readers can count on. An example schedule might look like this: Monday is a product review, Tuesday is an interview, and Wednesday is industry news. Thursday is an opinion piece, Friday is something funny and surprising video, image or story. Once you have some topics and a number of articles you want to publish monthly, start to hone in on article ideas. These can be pieces about your store, yourself, and your products. Here are some general rules of thumb to inspire you stay on track. Remember your audience. Try to come up with helpful tips, “how to” guide pieces, interviews with well-known people in your industry or in the culture that your store caters to. Consider hosting a contest and give out discounts or your store’s products to the winners. Use a formula. When writing how-tos, tips or interviews, use predetermined guidelines. For example, make your how-to pieces no more than five steps. Or for interviews, try to come up with a bank of questions that you can use over and again. Use recognized names. For interviews, try to track down well-known figures in your field and interview them about a related topic. Take advantage of their presence in the industry to help promote your goods or services. Personalize to your products. Link to industry news, but add something personal from your specific point of view, why this is important for your readers and shoppers to know about. Frame the news for your readers as it relates to your brand, or even better, how it relates to a specific product or service you offer. Tie to holidays, key events. If there is something going on the world, like a holiday or an event, try to showcase a product that reflects this period. Encourage community participation. This means allow for comments, but don’t publish or foster negativity. Perhaps give your customers and readers an invitation to write for your blog about their use of a product or service you offer, if they desire to. Invite customers and readers to send in images of themselves using your products in a new and interesting way. Writing a blog is informal and meant to have a casual tone. But there are a few formatting tips that will support your writing and make it stand out from the rest. For all articles you publish, try to strike a balance between the imagery, words, video (if necessary) and links. Remember — in any kind of writing — less is more. Focus on clear, crisp and concise writing, an image or two, maybe a link or two — whatever communicates the message most efficiently. From day-to-day, vary your posts in length, concept, topic and tone. If you published something about your company yesterday, write something about the lifestyle today. If your post was 500 words today, write something in 300 or less tomorrow. Feel free to add in links that are relevant. But try to be clear about where your reader is headed when they do click that link. If you need imagery and don’t have access to a good digital camera, consider using the Creative Commons (CC) bank of uploaded images. There are still some limits to the use of each image (for example, a photo credit is generally still needed, at least) and not all images are equal in the CC image bank, but it can be a useful tool. Be sure to track the activity of your blog with some sort of analytics software. [Google Analytics] http://www.google.com/analytics/) is a popular tool for traffic measurement, but there are many others including Clicky, Woopra or the open source Piwik. These tools will give you the ability to extract a greater meaning from the traffic to individual posts. In turn, you can give your readers more of what they are reading most and drop the articles that they are not interested in. Here are some examples of some very effective blogs that capture the lifestyle of each store’s customers in an interesting way. Ice.com’s Sparklelikethestars.com. This is jewelry retailer Ice.com’s celebrity jewelry blog. Notice how it focuses on celebrity jewelry, fashion, news and gossip. Ice.com knows that aligning the content of its blog with celebrities helps with search engine results and drives up traffic accordingly. 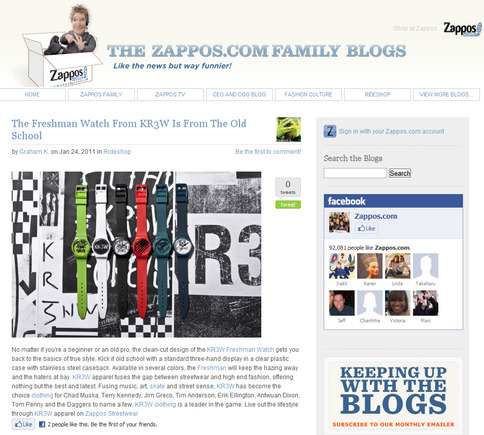 Zappos.com’s Family of Blogs. Zappos has dozens of blogs, from health to trends to fashion to a whole blog offering how-to tips. Each post integrates a particular Zappos product in a way that feels like useful advice and also aids in selling a product. Patagonia’s The Cleanest Line. 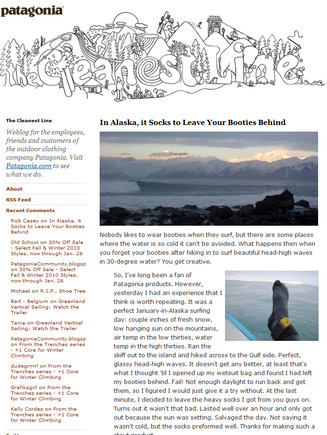 Patagonia focuses on the lifestyle of typical Patagonia customers on The Cleanest Line. They post about surfing, climbing, snow sports, environmental issues, outdoor activities, current discounts and occasional offbeat or humor pieces. It exploits the lifestyle of its customer base all the while frequently promoting the use of Patagonia products. Volcom’s Blog. Volcom uses its streamlined blog to post videos of athletes participating in those sports — skateboard, snowboard and surfing — that Volcom sponsors, while wearing Volcom clothing. The blog includes brief posts about company culture, alternative youth lifestyles and the latest from the catalog.